Looking for a gift for that hard to buy someone? 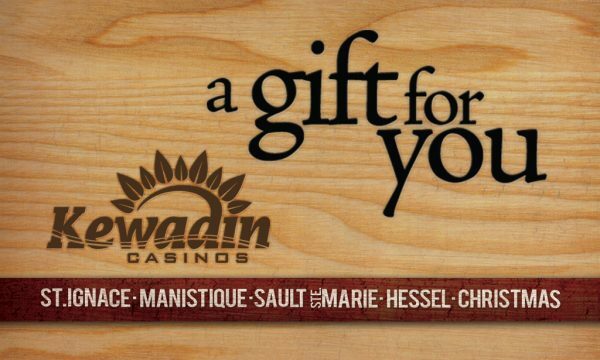 Look no further than a Kewadin Casinos Gift Card! Gift cards can be purchased at any restaurant, hotel, bar or gift shop location and can be used for goods and services at any of the above mentioned locations. Call 1.800.KEWADIN or email info@kewadin.com for more information. Gift Cards can be redeemed at any Food, Beverage, Retail, and Hotel location for goods and services. This does not include Entertainment at the time. Gift Cards can be purchased and have value added (reloaded) at any Food, Beverage, Retail, and Hotel location. This does not include Entertainment at this time. Valid methods of payment to purchase or add value to a gift card are: Cash, Canadian Cash, Check, or Credit Card. Gift cards cannot be redeemed for Cash (i.e. the cage).